You'll remember that a couple weeks ago I posted here that the N95 8GB had received a firmware upgrade allowing it to play youtube and other flash video site's videos without the need of any third party applications. As you should also know, I now have my own N95 8GB which I'm loving. Anyways, I thought I would make a small guide on two ways to watch youtube on the N95 8GB; Using the inbuilt browser and emtube. 1) Fire up your browser and head to the Youtube site. You'll be greeted with the above page if it's your first time so just click on "View Desktop Version"
2) Search for your desired video. 3) Click on your video of choice. 4) Double click on the actual video and it'll go into full screen. That's it. No need to install third party software. It's just like on your PC at home. The video is shakey when it hasn't been fully loaded yet. The video loads slowly compared to other methods. 1) Go to the emtube site and install the first downloadable option. 2) The zip file will automatically be opened by ZipManager, open and install the sisx file. Just keep pressing continue and OK during the installation process. 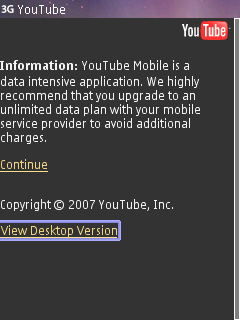 3) Once it's installed, go to your applications and open emtube which will be the last application. 4) Click on search and search for your desired video. 5) Click on your video of choice. 6) Press the select button on your N95 8GB once the video's loaded and if you want to go into full screen mode turn your device to the left (vigorously) or press the 1 key. Higher quality than the browser solution. No need to wait for video to load fully to avoid skips. Emtube is my favourite solution because of its speed, ease of use and reliability. Quality is something that I just can't ignore and youtube on emtube is filled with quality. hi can u help me on this i am using N95 8GB downloaded the emtube but now when play videos it gives the error Unknown file format or not supported file format and i m not able to download one i have a flash player installed too.